We happened to get a photo of the Northern Shrike coughing up a pellet yesterday, and thought we'd pass it along in case you found the whole notion of pellets hard to swallow. NJMC Naturalist Michael Newhouse is hopeful that the sightings of the shrike coughing up pellets is a sign that it has found a plentiful food supply and might stick around a bit. The shrike has been seen along Disposal road for five days now, and possibly could have been here a while before it was first seen last Friday. Chris Takacs reports he saw and heard the Northern Shrike on Disposal Road today around 8 a.m.– from a perch above the retention pond a from the AMVETS carillon in DeKorte Park. 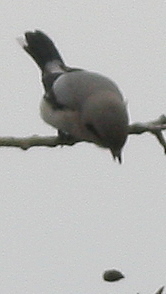 Previous posts have more information on finding Disposal Road and locating the bird. Bird Report 121509 –Shrike, plus! Amidst all the hoopla about the Northern Shrike, neglected to say there was some other fine birding on Disposal Road on Monday. Yes, the shrike was seen well into the afternoon, but we also had: a Gray Ghost at 7:45 a.m., two Great Blue Herons, five Great Egrets, a Belted Kingfisher, at least three Redtails, Gadwalls, Pintails, and GW Teal — plus other usual suspects, from Downy WPs to Northern Mockingbirds. Disposal Raod is very birdy these days. Coming soon: The holiday season wouldn't be complete without a photo of a Northern Shrike coughing out a pellet by Disposal Road — something about too much fiber in his diet. They can't all win beauty pageants. Who's this guy? Caught him posing a while back near the Transco Trail. 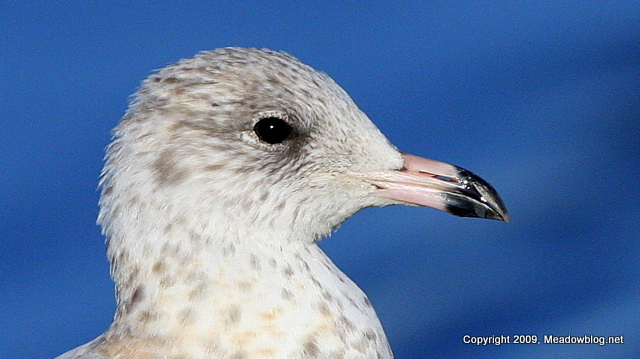 Click "Continue reading…" for the answer and more information on this gull.